I finally made a successful batch of bee fondant using the recipe from Honey Bee Suite. I like the common-sense approach of the author, and I was able to use my experience from three failed batches to improve what I was doing with recipes in general. 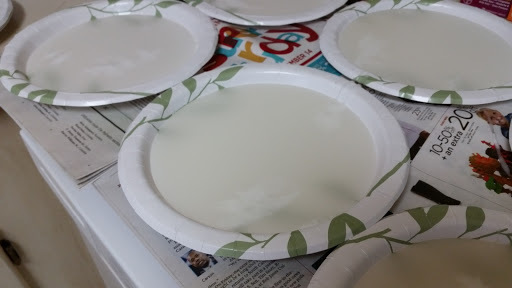 Five pounds of sugar yielded six paper dinner plates of fondant. We’ll let you know later how long it takes the bees to eat a plateful of sugar! If a hive has not had enough time to create a store of honey that will get them through the winter, the bee-keeper needs to supplement their food source. This is our first year with bees, and it has been an interesting learning experience. We started about a month before the summer dearth arrived with only a Nuc hive, but there were plenty of resources for the bees at the time. Things were going well all the way up to the dearth when the hive began to get weaker and weaker, then sometime between weekends, wax moths invaded and decimated our hive. We placed the infected frames in the freezer to kill the moths and larvae, but the hive was weakened severely and they were not able to protect themselves from the next attack — robbers. Feral bees attacked the weak hive and stole most of the honey and effectively ended the life of that hive. We restarted again, early fall season with two ongoing hives we purchased from a beekeeper who was getting out of the business. We currently have two strong hives, but they do not have as much stored honey as they should at this time of year. 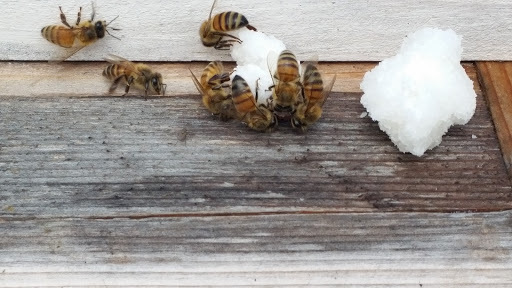 When it’s warm, one can supplement natural food sources with sugar mixed with water, either outside the hive or in a feeder placed inside the hive. In cold weather, bees stay in to keep the hive warm and cold syrup dripping on them doesn’t do them much good. Fondant is table sugar that has been cooked to break the sugar down into fructose and glucose — molecules that are more like honey and easier for the bees to digest. My first attempt used a scaled down recipe from Bamboo Hollow Apiary, and it’s a recipe I will go back to try again. Mistake one was thinking I could do this without a candy thermometer! I ended up with a brown sticky mess that I tried to give to the bees, but it acted like fly paper, so we very quickly removed it. Attempt two: I used the same recipe and my brand new, shiny candy thermometer. That was far more successful, but the temperature kept rising for long time after I turned the heat down. With the successful batch, I turned the heat down as the temperature approached 230 degrees and adjusted it up and down by one number on the dial until reaching the desired temperature. I plan to make the next batch on the gas burner on the grill to see if that is easier. So — I had a batch of fondant that had been heated a little too much, and when I went to pour it into a pan, the pan wasn’t where I had left it! By the time I found a pan, I had a huge sugar lump in the pot! I managed to break it up and scatter it on the pan, but it wasn’t pretty. The bees seemed to like it, but there was no way to fit the chunks under the hive lid. As the chunks weren’t really usable and leaving them outside the hive attracted ants, I decided to try dissolving and reheating them. By then, we’d watched a couple of YouTube videos that used Karo syrup to make the fondant more malleable (although other resources recommended avoiding Karo syrup and corn starch), so we stirred a little in. We poured the resulting mixture onto a wax-paper lined pan and it set very nicely. However — this mixture was hygroscopic, as we found when we cut the sheet into usable sheets and placed those sheets on a shelf in the refrigerator until we could place them in the hives. 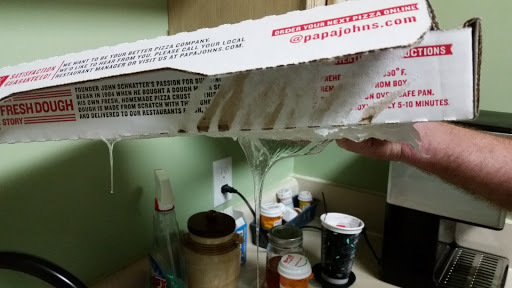 The next evening, our left-over pizza was firmly glued to the glass shelf and we dumped the remaining fondant into a glass bowl. By the next morning, the mixture had absorbed even more water and was quite runny. The bees are enjoying it, regardless. In fact, when I went to check one of the bowls this morning while it was still only 40 degrees outside, the guard bees from our strongest hive let me know that I needed to leave their bowl alone! Next Post Experimenting with canning.